Where do I begin with fennel? It’s something that I look at all the time, whether that be at the grocery store, or at a farmer’s market. Look, I said, not purchase. So I had to break that routine, and buy a fennel bulb. When I brought it home, I thought I might slice it and eat it raw, and then I took a look at the fennel fronds and thought I might use it as a garnish of some sorts, or place it in a salad. You can tell I was all over the place, and then I decided to simply roast the fennel and serve it as a side dish alongside some roasted chicken. If you have never had fennel before, it is pretty diverse and can be eaten raw, or cooked, and it has a mild licorice like flavor. With that said, you are probably either going to love it, or hate it. My family is on the neutral front. That’s it. Super simple, and a great side dish, especially with fish. Take the fennel bulb, removing the fennel fronds (the green stuff that looks like dill), and slice off the base of the fennel. 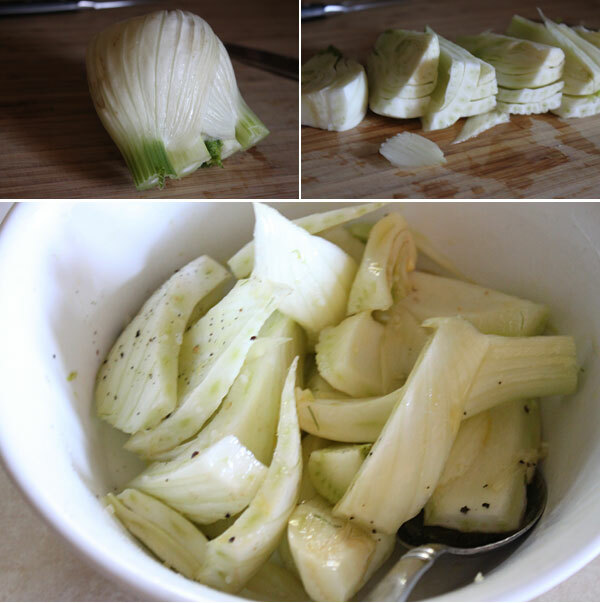 With the remaining bulb, thinly slice the fennel and add it to a small mixing bowl. Season with a generous pinch of salt and pepper, and give it a good mix. Once the oven is heated, place the fennel on a baking sheet, and spread it out. 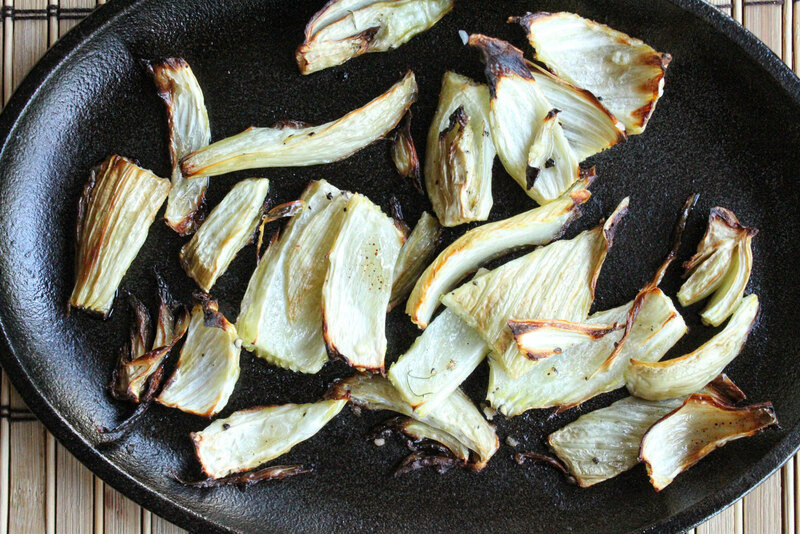 Roast the fennel in the oven for about 25 minutes or until the fennel gets nice and roasted and caramelized. Remove and serve. The end result is a nice and tender piece of fennel that is somewhat sweet, with a mild licorice flavor. Also note, fennel is really, really good for you, so if you are like me and look and fennel but never purchase it, go ahead and pick one up and serve it raw or roasted. You only live once, so go ahead and give it a try. Hope you enjoy! This recipe sounds simple yet great. Will make it soon:) Just let me know at which step olive oil should be added. Before oven or after?